Is it just me or are all BBQ restaurants closed on Sundays? Val and I travel a lot on weekends, and so Sundays we often find ourselves looking for a new restaurant to try on our way home – to make the trip an adventure unto itself. And our last two attemtps to visit BBQ restauarants – Andy Nelson’s BBQ and Black Hog BBQ – have left us staring at Closed on Sundays signs. Luckily the weather forecast made Saturday the best day for skiing over the weekend, perfect for stopping by Black Hog BBQ on our way to Whitetail Ski Resort (which was awesome skiing btw). 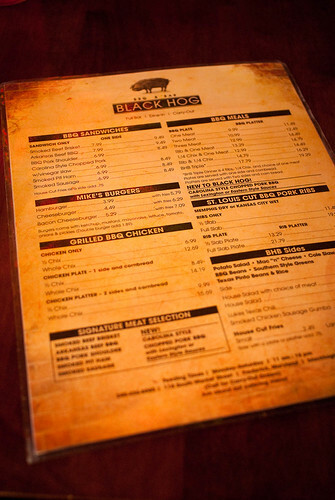 Black Hog BBQ is located in Frederick, MD about 45 minutes north of Washington, DC, in the heart of historic downtown Frederick. 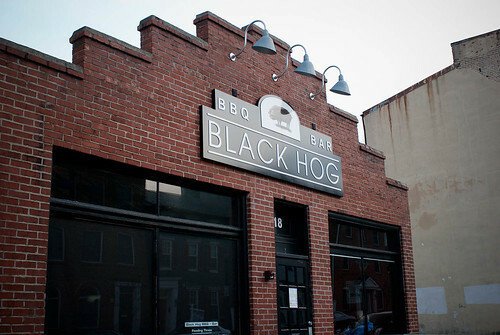 On an old city street lined with row homes and small business, Black Hog BBQ was pretty full at 3:30pm when we arrived. Val and I grabbed a table for two in the front, with about a dozen tables seating 2 to 8 around us. Behind the seating area, there’s a walk up counter for take out service and a small corner bar with a tv that seats about a dozen people. 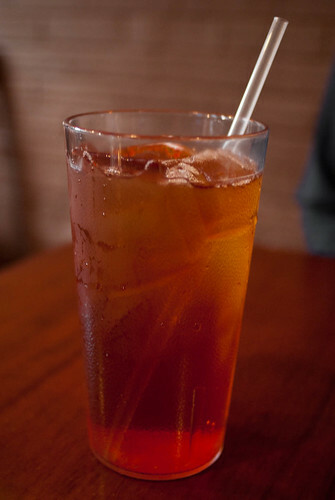 After ordering a round of sweet teas – like there was any choice – we started ogling the menu. Black Hog BBQ has a solid selection of BBQ fare, including brisket, ribs, pulled pork, chicken in addition to some lesser often found items like smoked sausage and Arkansas beef (which I’m unfamiliar with, but going to try next time – oh yes, we’ll be back). Since it was my first visit, I wanted to try some variety and had a BBQ Platter with smoked sausage and Texas beef brisket, coleslaw, collared greens. 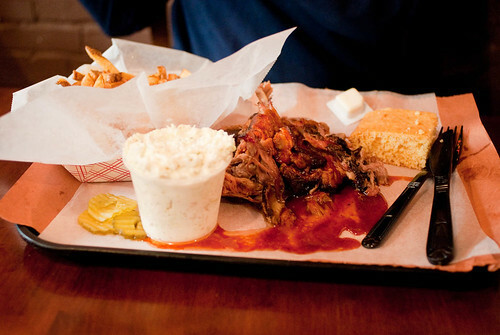 Val had a BBQ Plate (only 1 side) with pulled pork and coleslaw, and a extra side of fries. Both meals came with corn bread and pickles. Our meals arrived quickly and lightly dressed with BBQ sauce. 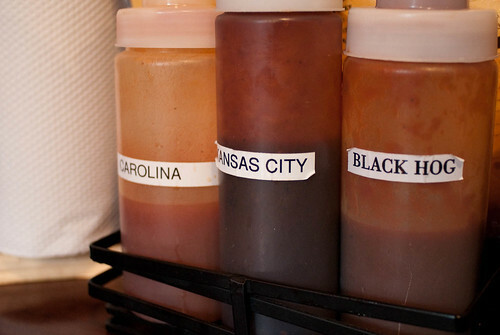 In addition to the pre-saucing, we had table-side options of Black Hog BBQ, Carolina, Kansas City, and Mustard sauces. I enjoyed the Black Hog BBQ sauce on my brisket, having a blanced sweet and vinegar flavor. I also enjoyed the Mustard sauce on my smoked sausage. In both cases, I felt the sauces really balanced well with the meats, not overpowering, but complementing. The sides were really good and Val enjoyed her meal as well. After finishing off another round of sweet teas and laughing at the “hand soap in a BBQ sauce bottles” in the bathrooms, we headed out – fueled up for an awesome evening of skiing.